It is estimated that more than a million people in the US have a dual diagnosis of Intellectual or Development Disability and Mental Illness (IDD/MI). These individuals have complex needs and present clinical challenges to the professionals, programs, and systems. NADD, an association for persons with developmental disabilities and mental health needs, developed the NADD Accreditation Program to improve the quality and effectiveness of services provided to individuals with a dual diagnosis through the development of competency-based professional standards and through promoting ongoing professional and program development. NADD offers accreditation of programs serving individuals with a dual diagnosis, rather than the agency or organization that offers these programs. An organization with several different programs that serve individuals with a dual diagnosis may seek accreditation for each of these programs. NADD is committed to being transparent about accreditation survey expectations, and for this reason the complete manual, including the survey assessment instrument, is available online for free. Programs that want to be known as providing quality services for individuals with a dual diagnosis should seek accreditation by NADD. Accreditation by NADD indicates that the program meets the standards established by NADD for providing services to individuals with a dual diagnosis. 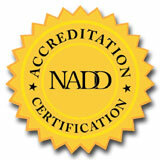 There is also the prestige of receiving a NADD Accreditation as it represents the NADD "Seal of Approval." The program may benefit in additional ways such as a greater perceived quality of service, additional referrals, and perhaps even increased fees from third party payers. A listing of all accredited programs will be maintained and this listing should facilitate referrals to programs that provide quality services for individuals with ID/MI. Regulatory agencies, parents, and other provider agencies will perceive the quality of services offered by the program to be meeting or exceeding industry standards as established by NADD. One way that NADD Accreditation differs from almost all other accreditation programs is the inclusion of a consultation component. Through their expertise, NADD surveyors are not only able to identify areas that are in need of improvement, but they are also able to offer concrete suggestions about how to improve the program. The consultation component takes place on site during the course of the survey. The Accreditation Survey includes (1) interviews, (2) records review, and (3) policy and procedure review. The NADD surveyor(s) will have face to face interviews with treatment team members, other staff involved in treatment of the individual, and program administrators. The NADD surveyors will complete a records review and interview of the treatment team members on specific cases to ensure clear documentation that reflects the individualized goals of treatment plan as well as direct observation of the staff and persons receiving services. The NADD surveyor(s) will review and assess whether the program practices reflect the best practice as established by the NADD accreditation. One reason that NADD developed the NADD Accreditation and Certification Programs  and one of the reasons that a program may choose to seek NADD Accreditation  is an interest in improving the quality of services provided to individuals who have IDD and mental health needs. NADD offers a broad range of training and consultation services concerning providing services to individuals with IDD and mental health needs. Programs seeking NADD Accreditation may choose to ask for NADD Technical Assistance Services to: (1) help prepare for an accreditation survey, (2) help plan for improvement of services after an accreditation survey, (3) train staff, or (4) for ongoing or as-needed quality improvement consultation. There is a $500.00 non-refundable application fee. A single application fee is charged, no matter how many programs an organization is seeking to have accredited. The cost of the accreditation survey depends upon the size and complexity of the program(s) being accredited. The cost is $2,000.00 per surveyor per day. There is a $1,000.00 annual fee to maintain accreditation, which is first due one year following the awarding of accreditation. A single annual fee is charged, no matter how many programs within the organization have received NADD accreditation. A full or complete NADD Program Accreditation is good for three years. After the initial accreditation period, accredited programs are required to have at least ten (10%) percent of their clinical and direct support staff certified through the NADD Competency-Based Clinical Certification Program and the NADD Competency-Based Direct Support Professional Certification Program. This can represent an additional cost. In an effort to control the cost of accreditation, NADD offers discounts on certification of personnel who work at an accredited program. The normal cost of clinical certification is $375 for a two year certification, with renewal costing $100. For clinicians who work for an accredited program, the cost is $250, with renewal costing $65. NADD Competency-Based Direct Support Professional Certification normally costs $60 for a two year certification, with renewal costing $30. The cost for DSPs who work for an accredited program is $30, with renewal costing $15.